Digital gangrene following arterial cannulation for invasive blood pressure monitoring is a dreaded complication. Radial artery is the preferred site for arterial cannulation but dorsalis pedis artery can be used in polytrauma patients when there are concomitant upper limb injuries. Though finger ischemia and gangrene following radial artery cannulation has been reported in literature, but gangrene of foot and toes following dorsalis pedis artery cannulation in adult is not yet reported. 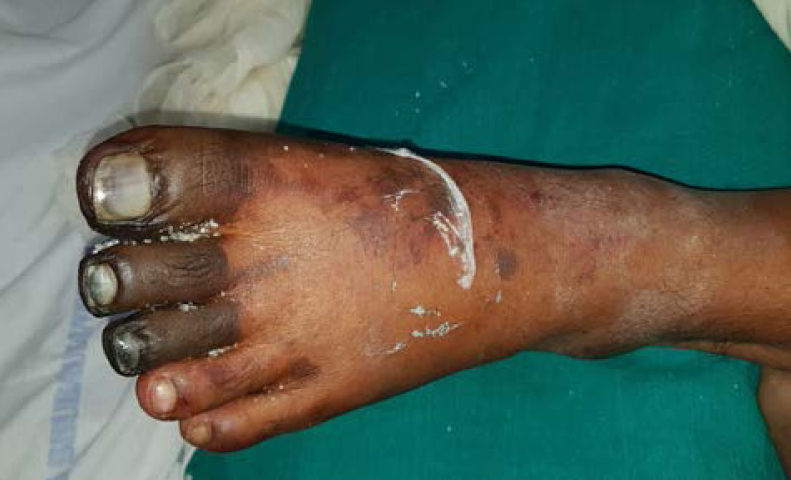 We are reporting a case of foot gangrene following dorsalis pedis artery cannulation in a patient of polytrauma with blunt trauma abdomen. A 32-year old gentleman presented to our emergency department with polytrauma due to road traffic accident and sustained blunt trauma to abdomen with crush avulsion injury and multiple fractures of bilateral upper limbs. His vitals were Blood pressure - 108/56 mm Hg in lower limb, Pulse rate-132/min, Respiratory rate- 20/min, GCS-14/15, RTS (revised trauma score)- 7.841, ISS (injury severity score)- 75, TRISS(trauma injury severity score)-40.8% and FAST positive. Arterial blood gas analysis showed metabolic acidosis with lactic acidosis. Patient was intubated in emergency, right Internal Jugular Vein central line and left dorsalis pedis arterial cannulation was done due to fracture of bilateral upper limbs. Intra-operative after giving laparotomy incision, there was sudden hypotension (BP- 76/34 mm Hg) which was managed with fluid and noradrenaline infusion. There was bowel perforation with peritonitis so thorough washout followed by closure with colostomy done. In the postoperative period, patient was kept in ICU for mechanical ventilation and vitals monitoring. In view of septic shock, noradrenaline support was continued. In the second postoperative day, patient developed patchy discoloration over dorsum of left foot, instep area and first 3 toes. Suspecting arterial thrombosis, arterial cannula was removed immediately and supportive treatment was started. The patient was in septic shock with coagulopathy (raised PT and INR), so heparin was avoided. Foot was covered and kept warm. Aspirin 100 mg/day OD and clopidogrel 75 mg/day was started. USG Doppler suggested pulsatile triphasic flow with normal flow velocities in CFA, SFA, popliteal artery, ATA and PTA and monophasic flow in dorsalis pedis artery. There was gradual progress of gangrene with demarcation and was limited to foot [Figure 1], [Figure 2]. Eventually patient succumbed to his injuries on POD 10. 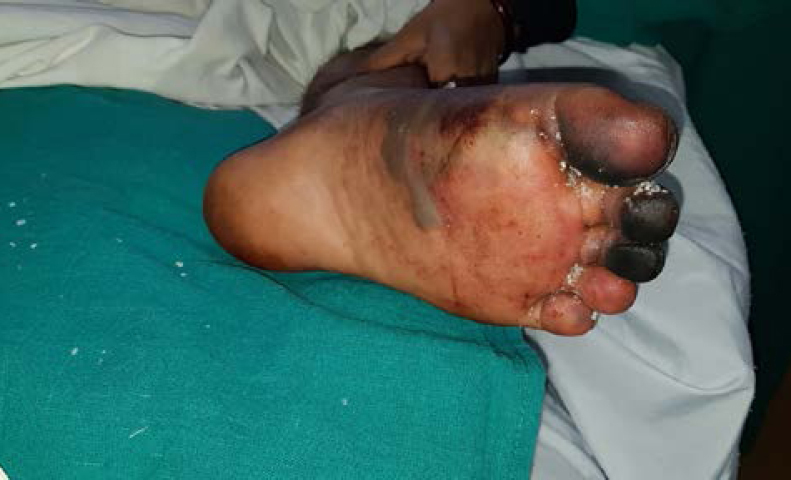 We suspect peripheral gangrene due to arterial thrombosis precipitated by low perfusion caused by high-dose vasopressors along with prolonged arterial cannulation as the causative factor. Figure 1: Discoloration over dorsum of left foot and medial three toes on POD 2 and tape residue over dorsum showing site of arterial cannulation. Figure 2: Discoloration over plantar aspect of medial three toes, medial aspect of foot and instep area. To conclude, we strongly recommend monitoring of limbs for signs of ischemia in patients with any of above risk factors in whom cannula has to kept for prolonged period and early removal of cannula when benefit is less than risk of keeping arterial cannula. Mandel MA, Dauchot PJ: Radial artery cannulation in 1000 patients. Precautions and complications, J Hand Surg 2(6):482- 485,1977. Brzezinski M, Luisetti T, London MJ: Radial artery cannulation: acomprehensive review of recent anatomic and physiologic investigations,AnesthAnalg109(6):1763-1781, 2009. Rehfeldt KH, Sanders MS: Digital gangrene after radial artery catheterization in a patient with thrombocytosis, Anesth Analg 90:45-46, 2000.